JPMorgan Chase CEO Jamie Dimon visited Boston Wednesday as his bank launches a retail banking expansion in the area — something that Citi tried but failed to pull off. 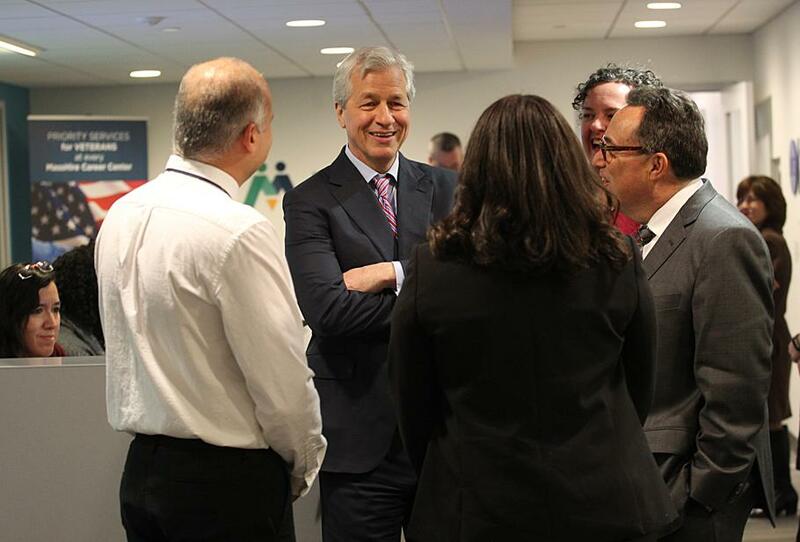 Jamie Dimon (left), the CEO of JPMorgan Chase, toured JVS Wednesday as part of his visit to Boston. Jerry Rubin, president of the vocational center, is pictured at far right. Breaking into Boston won’t be easy for JPMorgan Chase. But it’s not going to be easy on Chase’s local competitors, either. CEO Jamie Dimon and his team will need to chart a different path than the one Citigroup took. Citi came to town just over a decade ago with big ambitions: 30-plus branch openings, and a $34 million theater sponsorship. But Citi decided to give it all up in 2015. The branches closed; the name disappeared from the Theatre District marquees. Now, it is Chase’s turn to go “de novo’’ — industry-speak for opening new branches. Banks typically expand geographically by gobbling up smaller institutions’ branch networks in desirable markets: Do a deal, land a vault’s worth of new customers. That’s how Bank of America, Citizens, Santander, and TD Bank came to dominate Greater Boston today. But megabanks like Chase face a regulatory limit on how much they can expand via acquisitions. So Chase plans to open hundreds of branches one at a time here and in several other major markets, Philadelphia and D.C. among them. It can be slow, laborious work. Dimon doesn’t seem a bit fazed. The chief ­executive was all smiles as he visited Boston Wednesday to kick things off, with a review of the Downtown Crossing branch now under construction and a promise to give $1.1 million in workforce development grants to five local charities. The competition officially begins Thursday, with the opening of Chase’s first Boston-area branch, on Providence Highway in Dedham. Chase’s real estate scouts have been lining up leases like “Monopoly’’ properties during the past year. They identified 18 spots for branches that will open by the end of 2019, clustered in and around Boston, with a few North Shore and South Shore locations. In total, Chase wants to open 60 in New England, including 50 in Greater Boston, over five years. What makes Dimon so confident? He has a great brand with Chase, one that can be found on credit cards in countless wallets across the region. He says Chase already has roughly 1,000 employees here, working with business clients — a launchpad for the consumer business. And the first D.C. branch has far exceeded his expectations since it opened last month. Here’s another reason he should be confident: Local bankers are worried, or they’re at least paying much closer attention to Chase’s advances than they did when Citi arrived on the scene. Chase has a stronger reputation than Citi for executing a retail strategy. Chase’s array of mobile banking products gives it more of an edge today, now that so many consumers are banking with their phones. The incumbents are bracing for a fight for customers, and for talent. Growing around here without a big acquisition is tough, but not impossible. Capital One has made headway among millennials with its cafes in Boston — not traditional bank branches, but still magnets for potential online customers. And First Republic is now among the biggest banks in Boston, based on deposit market share, although it is a “private bank’’ that targets the well-to-do. Dimon says he won’t be satisfied until Chase is in the top three in Boston. He knows it won’t happen overnight, particularly not in such a competitive market. But Chase isn’t going to pull a Citi: Dimon says his bank won’t be a fair-weather friend. Chase, he pledges, is here for the long haul. It will need to be.